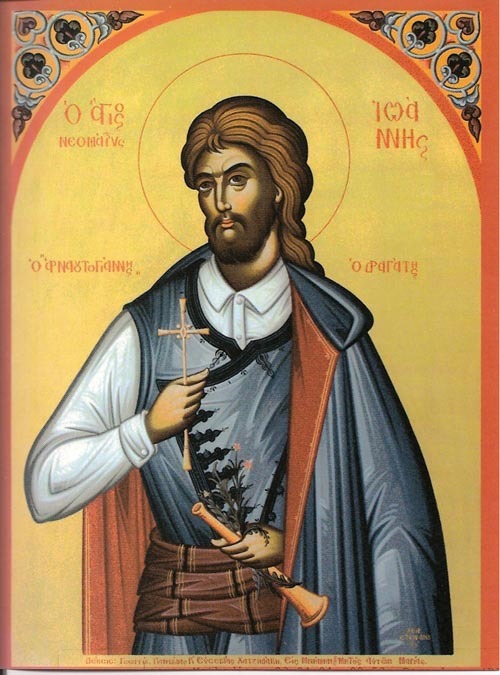 John was an Albanian soldier, and was nicknamed "Arnaoutoyiannis". * He was given the name John when he was baptized a Christian after converting from Islam. Arnaoutoyiannis resided in the village of Agios Ioannis in the municipality of Faistou on the island of Crete. There he lived a life of piety and devotion, exercising the profession of dragatis, or field guard, in order to secure a livelihood. Certain rebels killed two Turkish beggars. The Ottomans who hated John due to his renunciation of their religious beliefs, found an opportunity to avenge him. They delivered him to the secular power of the region, accusing him of the murder of the two Turks, explaining that after his conversion to Christianity he sought to destroy Muslims. John was arrested and sent to Heraklion for trial. The judge Rechit-Ephentis asked him to return to Islam in order to show that he did not murder for religious purposes, otherwise he would be condemned to die. John confessed Christ, and in turn was tortured for three days with horrible torments. Among other things, they heated an iron pot and placed it on his head. When Saint John delivered his soul to God, the Pasha ordered for the Christians to take his body and bury it. They took it and buried it at Spitalia (where the old Health Service in Heraklion used to be). John's martyric death spread sorrow and indignation among the Christians in Heraklion. The day was Saturday 5 May 1845, and as Stephanos Nikolaides mentions in his brief biography, Christians took a stance against the government for killing Arnaoutoyiannis. To satisfy the people, Rechit-Ephenti was exiled and replaced by Koulouktzi-Meimouri. After some time, the translation of his relic took place and they were found sanctified. The Consul of Russia took them and sent them to Kiev, where his relic remains till today. * The term "Arnaout" was used for the first time during the Ottoman Empire, where Albanians were known as Arnaouts, and Albania as Arnautluk. "Yiannis" is Greek for John. With good courage you renounced your ancestral error, and quickly as one who came to know faith, Christ's athlete was numbered among the glorious chorus in Mesara; as a protector of fields you were highly favored, appearing as a brave Neomartyr of piety, intercede that we who are glad in you will receive grace.